AoA! Friends today I am gonna tell you how you can browse Youtube easily without using any proxy,software like Hotspot Shield or Unblocking website while living in Pakistan.These are the latest methods in 2014 and are easy to use.There are actually 3 methods for opening Youtube in Pakistan.Now let me discuss all these methods in detail. In the next step you just need to put the username and password given above in the boxes to connect to your newly created VPN connection give ”mybestvpn” as Username and ”freevpn” as password. Now after clicking on ”I Agree” open Youtube.com and enjoy surfing it normally without Ads and any other Problems. 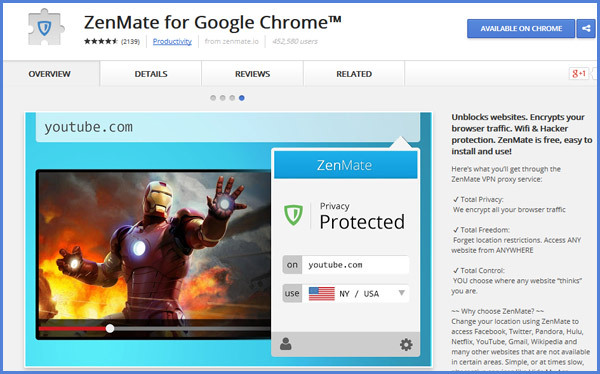 In this method we will install ZenMate extension which is only for Google Chrome if you dont have Google Chrome download and install it.Now let me tell you how to install and use it. Congratulations! You have successfully unblocked Youtube and surf safely.If you are having any question feel free to ask.I will love answering them.Take care & Allah Hafiz! Next articleHow To Auto Add All Friends In A Facebook Group With Single Click? great post admin….keep it up,thanks. Method 2 is known to me, while method 1 is new for me. Thanks for the update dear. Thanks a lot 🙂 finally I unblocked youtube without without hotspot shield and ultrasurf… Very nice tut KeeP It Up! Thanks a lot brother for this awesome tutorial 😉 Finally I am able to browse all blocked websites with full speed.Keep sharing tricks.